If you are experiencing depression yourself, some of the points below may be helpful. This is not an exhaustive list, and it’s not medical advice. These things are what I aim for in periods of depression; I certainly don’t manage it all the time. Remember, relapse is part of recovery- this is not a checklist to judge yourself against. – The first thing to do is stand up straight. Keep your head high, roll your shoulders out and back, fill your lungs with air and breathe out slowly. And again. Think about how important posture is for our physical strength, then remember it’s equally important for your mental strength. I know I often experience depression as a physical sensation (among other things.) My backbone literally feels heavy, like it’s made from lumps of rock. I feel like this stone-spine is pulling my chest down and making me slouch. Which obviously makes me feel worse. You’d be surprised how helpful posture can be for your mood. So whenever you’re feeling a bit overwhelmed, pay attention to how you’re standing. – Ask yourself, ‘Have I been training too much?” If the answer is yes, or even maybe, take two or three days off. In a row. Then, dial it back a bit. Many of the symptoms of overtraining syndrome are exactly the same as the symptoms of depression. You may have just been overdoing it. Remember to manage your rest. Without sufficient rest, your muscles simply will not be able to rebuild before you tax them again: it will make you weaker. Rest is equally important for your mental health. Functioning under constant fatigue will hinder your ability to make precise and swift decisions, it’ll weaken your concentration and will sap the joy out of your training. – Minimise use of drugs and alcohol. Good advice at the best of times, the best advice at the worst. – Avoid attaching too much importance to changes in your weight in times of depression. Rapid loss or gain of weight is a common symptom. Remember, it’s just that, a symptom. Overloading yourself with pressure to diet away some weight gain, or to kick yourself back up to a fighting weight when you’ve lost interest in eating, ignores the cause of that change. Try to maintain healthy and regular eating patterns, as always, but it’s more important to focus on your recovery. You’ll return to your normal weight soon enough. And, if you do lose weight, try not to set that as a new goal weight for yourself, or to view gaining the weight back as a failure. Remember, the weight gain is due to illness. – Keep in mind that your training will probably have to change when you’re depressed, and this is not a sign of weakness. If you sprain your ankle, you don’t drill 500 jumps. You might work on handstands instead. So, if you’re in a period of depression, you will have to find the style of training that is best for you right now. I know when I am very depressed, I have a constant stream of negative self-talk in my mind, and if I am faced with consistent failure to break a particular jump, that negativity is reinforced in a vicious circle. You may not have the mental capacity to break jumps right now. It might be time to focus on technical foot placement drills. Or, if your concentration is shot, beasting conditioning might be the path for you. 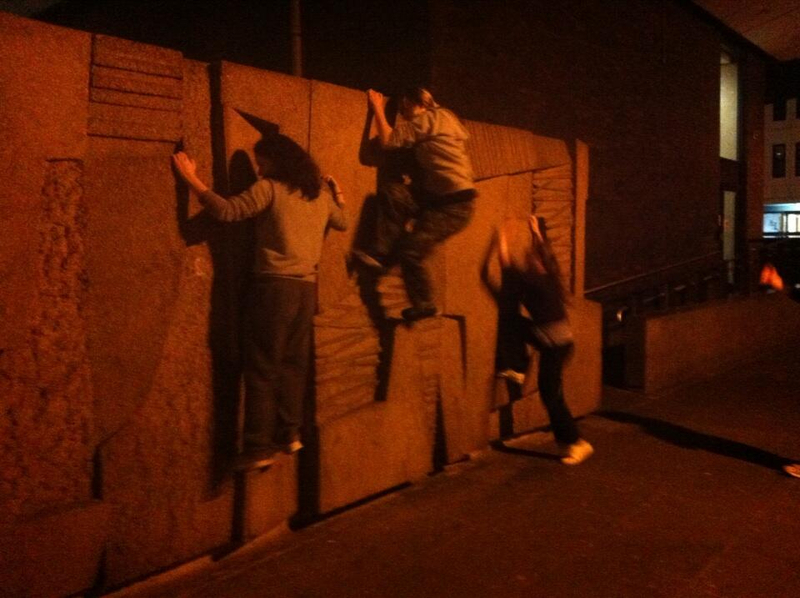 Everyone is different, and the breadth of possibilities within parkour training means there is always another option. This is not about avoiding what is hard- your training should still be difficult, and should challenge you every day. The key is to find what is most productive for you right now, and what is not going to exacerbate your condition. See above, re: sprained ankle. – Be proud of your achievements. It’s not the size of the obstacle that matters, it’s how you overcome it. And when you’re experiencing depression, there will be days when simply getting up and going for a walk in the park takes more effort, energy and persistence than a round of climb-up ping-pong at the Wall of Tears ever could. Don’t berate yourself for imagined failures; be realistic, recognise your achievements and be proud of them. – Drill it! There are various kinds of mental exercises you can do which may help. Do your research, look into Cognitive Behavioural Therapy (CBT) exercises, and see if they work for you. The mind is a muscle. – Find an activity that has a meditative effect, allowing you to ‘switch off’ the feedback loops in your mind that can be a part of depression. It could be any of the thousands of techniques for meditation; try as many as you can, in a class situation or by yourself. Or it could be something else; for me, it’s distance running- on a good run, I can achieve a kind of flow state that allows my mind to rest. – Regarding your medical options, if you do decide to start taking some sort of medication, remember to ask your doctor all the questions. I have been on anti-depressants, and to be honest, it probably saved my life. But I’ve also come off anti-depressants. And that affected me a lot: any impact or sudden change in direction gave me ‘brain jolts’, and my balance was so badly affected I couldn’t stand on one leg. Make sure your doctor understands your training and other needs, and ask questions about both the possible side-effects of the drugs, and about what happens on the other side. Also, remember, you will be taking the medication for a long time; at least a year, and probably a lot longer. Some medications can make some conditions worse, so you will need to monitor your emotional state well, and keep in contact with your doctor and/or counsellor. I am not advocating against medication, as I’ve said, it’s been hugely beneficial to me. But remember, medication is not a silver-bullet, and this is not a decision to be rushed. After all that, I think the two best things you can do for yourself if you are experiencing depression are to talk, and to move. Talk. Talk to your friends and family, talk to your doctor, talk to other people you know who’ve experienced depression. Talk until you’re bored of talking. Talking will help you to understand what you’re experiencing, and to keep yourself on track to recover. And move. Just MOVE. The feelings associated with depression are all about heaviness, and dragging down, and weight. But if you just start moving, that heavy burden will drop away, at least for a little while. Start running, and the black dog can’t keep up with you. So, run and skip and dance and laugh and climb and jump. I’m right there with you. Looking back, it has been a part of my life for a long time, probably since I was about 13 or 14. It has affected me in various ways, and led to some less-than-healthy behaviour over the years. Since finding parkour, I can honestly say that it has been (among other things) the most powerful and effective force in my life for dealing with depression. I’m writing these blog posts partly to offer some small pieces of advice gleaned from my own experiences with depression, and how it affects and is affected by my training. I’m also writing because I hope this may start one or two conversations about mental health. I know first-hand how beneficial parkour training can be in combating depression. I also know that the issue doesn’t come up in conversation all that much, certainly not compared to how much we chat about DOMS or shoulder mobility or other physical issues; and this is despite the inestimable importance of mental focus, and health, in our training. – changes in sleeping patterns: sleeping very little or far too much, sleeping at weird or inconsistent times of the day. Changes in behaviour that match these symptoms could point towards depression, so watch out for them in yourself and your friends. So, what should you do if you think a friend may be suffering from depression (or any mental illness)? You should talk to them about it. The point of talking with those who may be suffering from depression is not to take on emotional responsibility for other people’s problems, nor is it to act as a proxy doctor or therapist. That is not the role of a friend. The aim of talking is to open up a safe space for your friend to admit that, yeah, something is wrong. Unfortunately, depression and mental illness still do carry heavy social stigmas. People will often “put up” with depression for fear that others will see it as a weakness, judge them for it, tell them to just “get over it.” I know I did for years. (Spoiler alert: it didn’t work.) If you start the conversation, your friend may let go of their fears of being judged as weak or ridiculous, and begin to address their illness. Because mental illness is not weakness. And it’s not going to just go away. It is not something that you should put up with either. You are stronger than that, even if you don’t know it yet. If you saw a friend limping on a swollen ankle, you wouldn’t ignore it. You’d ask them how it felt. You’d tell them to address the problem, and help them if you could. I’ll return to this comparison, because depression is like a sprained ankle in many ways. Sometimes you can identify how and why the problem arose; stressful life events or loss of a close relationship. But sometimes you can’t. Sometimes it’s a diminished capacity that passes quickly, if given the required care. Sometimes it’s a chronic recurring problem, which needs to be managed vigilantly. Just as most of us get injured at some point, mostly minor things but sometimes not, most of us will have some experience of depression or other mental illness, to varying degrees, at some point in our lives. In a community that focuses so much on strength, the nature of mental strength can so easily be misunderstood. Mental strength is not some kind of hyperbolic toughness, or the cerebral equivalent of brute force. That’s not what we identify as strength in the physical realm; otherwise we’d all do nothing but deadlift all day. The key components of mental strength, in my opinion, are flexibility, adaptability, agility, humility, perseverance. It’s exactly these qualities that come to the fore when recovering from depression; it seems odd to say, but in my experience, taking on depression and working to overcome it has made me stronger in all of those areas. We aim to be strong to be useful. Pretending there’s nothing wrong is no use to nobody. I worry that some of the rhetoric surrounding parkour may discourage people from speaking about their mental health, precisely due to those social stigmas that paint depression as some sort of silly affliction for the weak-willed. This is the most heart-breaking part, because I know it’s so far from the truth. These ideas are not generally held or defended by individuals; stigmas exist like a kind of cloud of illogic and negativity, and guesses at what others might think. They are only kept alive in darkness, and can potentially disappear if we simply speak openly. I know that the parkour community is a supportive one, and that speaking to my training buddies will not be met with scorn or censure, but with care. I want everyone else to know that too. We need to ensure that the discussion of mental illness is just as open and socially encouraged as the discussion of physical illness or injury. The question “How are you coping with depression?” should be asked and answered as freely as the question “How’s that ankle recovering?”. I feel this is particularly important for our community because I know that parkour training can be a catalyst for change in the lives of people with depression. The discipline can provide a structure for those who feel helpless, the community provides support for those who feel hopeless, and the daily achievements and progressions give confidence to those who feel worthless. The experience of flow can approach meditative focus to calm the mind and the physical exertion is a key to recovery as well. As I said, I hope this can be the beginning of some open conversations, and I know we can all help each other. In a blog post to follow, I’ve written some snippets of advice for those who may be struggling with depression. 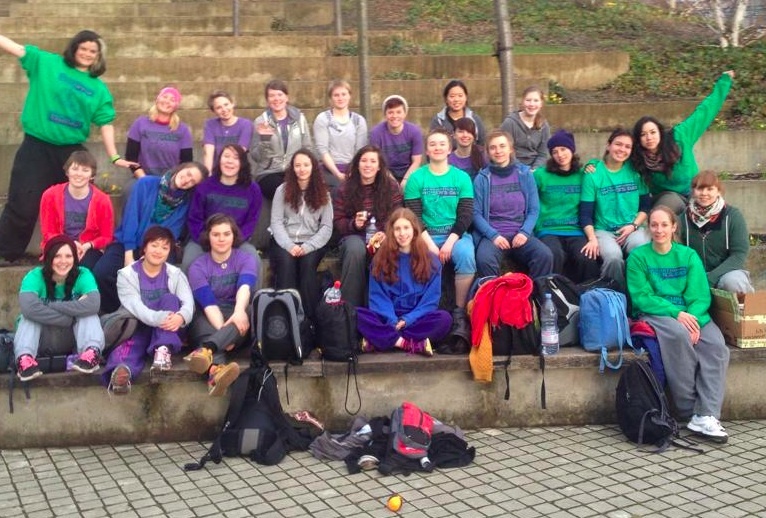 Holly is featured in “Meet the students” on Glasgow Parkour Coaching’s website. A great little introduction, with some wise words from Holly!